David Tennant (lair ing West Lothian, Sekotlan, Karajan Manunggal, 18 April 1971; umur 48 taun;lair:David John McDonald) punika aktor asal Sekotlan. Panjenenganipun minangka serves Giacomo Casanova ing filem Casanova. 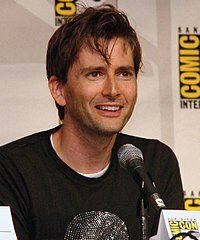 Dhèwèké uga dadi Barty Crouch, Jr. ing filem Harry Potter and the Goblet of Fire. 1992 Bunch of Five Policeman Siri 1, Episod 5: "Miles Better"
1993 Rab C Nesbitt Davina Siri 3, Episod 2: "Touch"
1995 The Bill Steve Clemens Siri 11, Episod 128: "Deadline"
1995 The Tales of Para Handy John MacBryde Siri 2, Episod 2: "Para Handy's Piper"
1999 The Mrs Bradley Mysteries Max Valentine Siri 2, Episod 1: "Death at the Opera"
1999 Love in the 21st Century John Episod 1: "Reproduction"
2000 Randall & Hopkirk (Deceased) Gordon Stylus Siri 1, Episod 1: "Drop Dead"
2001 People Like Us Rob Harker Siri 2, Episod 4: "The Actor"
2001 High Stakes Gaz Whitney Siri 2, Episod 1: "The Magic Word"
2002 Foyle's War Theo Howard Siri 1, Episod 3: "A Lesson in Murder"
2003 Posh Nosh Jose-Luis Siri 1, Episod 3 dan 8: "Paella" and "Comfort Food"
2009 The Sarah Jane Adventures The Doctor Siri 3, Episode 5 dan 6: "The Wedding of Sarah Jane Smith"
2009 The Catherine Tate Show Ghost of Christmas Present "Nan's Christmas Carol"
2012 Playhouse Presents Will Siri 1, Episod 1: "The Minor Character"
2010 My Life Narrator Episode: "Karate Kids"
2010 Chris Moyles' Quiz Night Himself Regular slot: "David Tennant's Celebrity Impressions"
2011 Laughing at the... Himself Series 1, Episode 2: "Catherine Tate: Laughing at the Noughties"
2012-2013 Dragons: Riders of Berk Spitelout Series 1, Episode 12, "Thawfest" and Series 2, Episode 5, "Race to Fireworm Island"
2013 Fish Hooks Oscar's Brain Series 3, Episode 3, "Live at the Hamsterwood Bowl"
↑ "IMDb isting "The Brown Man"". ↑ "This ifs Jinsy: Amazing Guest Stars Announced". Sky Atlantic. Dijupuk 2 Jun 2011. ↑ "What makes me happy". Whatmakesmehappy.tv. Dijupuk 6 April 2011. ↑ "Derren Brown: Trick or Treat". Channel 4. Dijupuk 4 July 2011. ↑ "NR special: Caught in the Web". BBC News. 9 February 2010. Dijupuk 1 May 2010. ↑ "One Programmes – Diet or My Husband Dies". BBC. Dijupuk 6 April 2011. ↑ "Doctor Who". BBC America. Dijupuk 6 April 2011. ↑ "The Father of Ostrali". Caledonia TV. Dijupuk 19 January 2011. ↑ "Starlight on TV". Starlight: For The Children. Dijupuk 22 April 2011. ↑ "The TA & The Taliban". Sky TV. Dijupuk 4 August 2011. ↑ "Gerry Rafferty: Right Down the Line". BBC. Dijupuk 26 August 2011. ↑ "Shrek: Once Upon a Time". BBC. Dijupuk 24 December 2011. ↑ "Earthflight". BBC. Dijupuk 24 December 2011. ↑ "Catherine Tate: Laughing at the Noughties". Dijupuk 22 April 2012. ↑ "Wild About Pandas". Locate TV. Dijupuk 22 January 2012. ↑ "Tennant joins CBeebies show Tree Fu Tom". Belfast Telegraph. 29 July 2011. Dijupuk 29 July 2011. ↑ "BBC season tackles disability in the 21st century ". BBC. Dijupuk 24 February 2012. ↑ "Discovering Hamlet ". Sky Arts. Dijupuk 24 February 2012. ↑ "David Tennant on Hamlet ". BBC. Dijupuk 12 July 2012. ↑ "Exclusive Clip: Doctor Who's David Tennant Guests on Star Wars: The Clone Wars". IGN.com. Dijupuk 6 November 2012. ↑ "Penguins - Spy in the Huddle". Radio Times. Dijupuk 4 February 2013. ↑ "SPACES". Scottish Screen Archive. Dijupuk 14 September 2011. ↑ "BITE". Scottish Screen Archive. Dijupuk 13 September 2013. ↑ "'Dragon' set to slay 'Alice'". The Independent (UK). 26 April 2010. Dijupuk 26 April 2010. ↑ "Hollywood comes to isle of 'Hegg' in a Local Hero for the 21st century". The Scotsman (UK). 15 May 2010. Dijupuk 30 May 2010. ↑ "David Tennant to star in Fright Night remake". BBC News. 9 June 2010. Dijupuk 9 June 2010. ↑ "Cultural Olympiad: watch the making of The Golden Nit". The Telegraph (UK). 18 June 2011. Dijupuk 18 June 2011. ↑ "Postman Pat to make movie debut". BBC (UK). 16 September 2011. Dijupuk 27 May 2012. ↑ "Postman Pat to Hit the Big Screen in 3D". ComingSoon. 16 September 2011. Dijupuk 27 May 2012. ↑ Herald Scotland (15 January 1990). "Village idiots play the fool". Dijupuk 24 December 2011. ↑ Birmingham Mail (5 May 2013). "Dr Who star David Tennant given his big break by Midland theatre boss". ↑ "Panto Listings", The Stage, 9 December 1993. ↑ Dessau, Bruce (7 October 2010). "David Tennant channels other stars in Celebrity Autobiography". The Evening Standard (London). Dijupuk 8 October 2010. ↑ "Facade". David Tennant Radio Archive. Dijupuk 16 July 2012. ↑ "Blog Archive » David Tennant Plays". Craig Murray. Dijupuk 6 April 2011. ↑ "Dogfish". The Book Depository. Dijupuk 16 January 2012. ↑ Mahoney, Elisabeth (23 November 2010). "How Roald Dahl Shaped Pop – review". The Guardian (London). Dijupuk 27 January 2011. ↑ "Book at Bedtime – A Night with a Vampire". BBC. Dijupuk 27 January 2011. ↑ "David Tennant records audio edition of 'My Sister Lives on the Mantelpiece'". Orion Books. 17 February 2011. Dijupuk 17 February 2011. ↑ "Kafka The Musical confirmed". David Tennant – The Site. Dijupuk 23 January 2011. ↑ "BBC Radio 4 Publicity". BBC. Dijupuk 15 April 2011. ↑ "BBC Podcast: Tales of Hans Christian Andersen". BBC. 2011. Dijupuk 5 May 2011. ↑ "BBC Radio Programme Information BBC Week 29". BBC. 1 July 2011. Dijupuk 1 July 2011. ↑ "BBC Radio Programme Information BBC Week 38". BBC. 1 September 2011. Dijupuk 4 September 2011. ↑ "Life and Fate". BBC Radio 4. ↑ "Book at Bedtime – A Night with a Vampire 2". BBC. 21 December 2011. Dijupuk 24 December 2011. ↑ "David Tennant voices Chitty Chitty Bang Bang sequel". BBC. 21 December 2011. Dijupuk 24 December 2011. ↑ "The Pied Piper of Hamelin". BBC. Dijupuk 24 December 2011. ↑ "MacLehosePress". MacLehosePress. Dijupuk 17 February 2012. ↑ "Stonemouth". The Radio Times. Dijupuk 9 March 2012. ↑ "Believe It!". BBC Media Centre. Dijupuk 20 April 2012. ↑ "Shakespeare And Love - Romeo And Juliet, & Twelfth Night". MacLehosePress. Dijupuk 17 February 2012. ↑ "Shakespeare And Love - Romeo And Juliet, & Twelfth Night". BBC. Dijupuk 17 February 2012. ↑ "Silver: Return to Treasure Island (Unabridged Audiobook)". Amazon. Dijupuk 24 February 2012. ↑ "Kenneth Branagh and David Tennant read BOND". The Book Bond. Dijupuk 15 June 2012. ↑ "The Great Scott: The Fair Maid Of Perth". BBC Media Centre. Dijupuk 31 March 2013. Wikimedia Commons duwé médhia ngenani David Tennant.